Clips used to attach the cable at the shifter and at the transmission bracket. Sold in 2 pack. 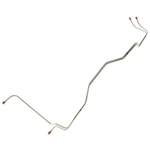 Reproduction clutch fork return spring with small block Attaches from the engine mounting bracket to the clutch extension wire. Reproduction clutch fork return spring with big block Attaches from the engine mounting bracket to the clutch extension wire. Clutch return spring extension rod. This reproduction of the original upper push rod boot for 1967-69 Camaro and Firebird models with manual transmission. It is molded using correct E.D.P.M. stock and is superior to the original. Molded in steel insert distributes mounting screw pressure. Fits small block and big block applications. Reproduction clutch fork boot. For small block and big block applications. Drive shaft straps mounts. Used to secure drive shaft u-joint to rear axle. Sold in pairs. Hardened pin stud, lock washer, nut and shifter cable retaining clip. 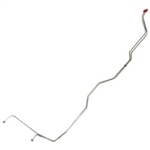 Used on TH-350 and TH-400 with cable shift. Clutch big block lower push rod. Swivel pin stud, (2) washer, grommet and retainer. Used on TH-350, TH-400 TH200-4R and TH700-R4. Reproduction transmission gear selector used with all floor mounted factory TH-350 and TH-400 with automatic shifters. Clutch small block lower push rod. Chrome shifter ball with 3/8" threads. 9 oz chrome ball. Fits all Hurst style shifters with 3/8" threads. Chrome shifter ball with 5/16" threads. 9 oz chrome ball. Fits all Muncie style shifters with 3/8" threads. Two piece black/chrome shifter ball with 3/8" threads. Fits all Hurst style shifters with 3/8" threads. Two piece black/chrome shifter ball with 3/8" threads. Fits all Muncie style shifters with 5/16" threads. Transmission shift cable bracket for GM 400 Turbo Trans. Correct transmission shift cable bracket for GM 350 Turbo Trans. This bracket mounts to the lower LH side of the transmission case. Does not mount to the pan bolts like later style brackets did. 1967-69 Camaro Firebird T-350 Transmission Cooler Lines; 2 pcs. 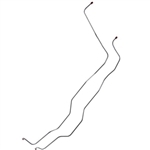 1967-69 Camaro Firebird 700R Transmission Cooler Lines; 2 pcs. 1967-69 Camaro Firebird T-400 Transmission Cooler Lines; 2 pcs.